Whether you’re running a business from home and need an expansive office space, or if you just want a place where you can focus from time to time when you work from home, you can feel confident PTIOF will match you with the proper furniture so you can set up a home office that’s perfect for you! Step number one to creating your dream home office? Picking a location. Can't really create something unless you have somewhere to create it. Right? Anna Habig, a designer at office design company, dPOP!, says when working on a home office design, she ask her clients to think about what type of space they're most productive in. "Some people work best lounging on a comfortable sofa with some background noise like a TV or music, while others work best in a typical desk and chair setup where they can focus – or maybe you need both," says Habig. So how do you choose the right spot for your office? You’ll want to take the three S’s into consideration: size, sunlight and sound. Start by figuring out how much space you’ll need for your home office. Will you be using it to do bills and personal projects? Then you might not need a whole room dedicated to your office – maybe a section in the kitchen or the living room would suffice. Will you be running a full-fledged business from your home? Then you may want an entire room. This one goes back to Habig’s point about knowing what kind of environment you work best in. Are you more motivated when there’s natural light coming in? Then you’re going to want to make sure you’re by windows. If you prefer artificial light, or if you’re using your office as an editing suite or something that would require less light, an interior room could work well. If you find it hard to work with lots of noise and distractions, then a high-traffic place in your house might not be ideal. Do you want to go somewhere you can shut the door and block off some of the noise? These are all things to consider when choosing your home office location. Don’t feel like you have to paint your walls beige to be productive. You want your home office to be a refection of you, one that inspires your creativity and productivity. If bright colors energize you to work, then go with it! If you prefer calm colors while you’re working, that’s okay too. “I think the biggest home office trend right now is that there is no wrong or right solution. You can choose a color that makes you feel energized, calm – whatever you need to work best,” says Habig. Looking for some color inspiration? Gray has really been the color of the year. It’s taken over everything. From living rooms to kitchens, and even in your home office, it’s the perfect, modern neutral to set the base for pops of color in your accessories. Once you have a space and you’ve painted the walls, it’s time to start bringing in the furniture! The cornerstone of every home office is the desk. It’s where you’ll be spending the majority of your time while working, so you’ll want it to be stylish and functional. Traditionally, desks come in five different designs: secretary, corner, writing, computer and hutch. A secretary desk is the combination of a writing desk and an organizational unit and is perfect for the occasional desk user. Traditionally, you can fold the writing surface out and reveal an area for storage. This makes it a great option to store mail, bills, notes and office supplies, while keeping your space looking neat and tidy. More modern secretary desks have the writing area already exposed so you don’t have to worry about folding anything out, but they still come with built-in storage. Corner desks are a great way to save space. They fit conveniently into a corner, making your room feel more open. While they’re commonly compact units, you can find larger wraparound corner desks that provide you with a lot of surface space. Whether you have a small space to work with or if you have a larger space and need a big work surface, a corner desk can work great for you. 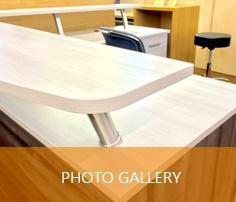 Minimalist design is sweeping the home office world, and with it come simple, clean desk designs. Writing desks are perfect for a sparse aesthetic. With a larger desktop, there’s more room for writing and less focus on storage. The sleek design of a writing desk keeps the space feeling modern and elegant. A computer desk is the most common style found in a home office. It comes with a large desktop area and space for a computer tower and monitor, as well as storage for all of your accessories. Typically, they have an area in the back that keeps cords out of sight as well. If you plan on having a desktop computer set up in your home office, a computer desk is the way to go. Last, but not least, is the office hutch. If you need a lot of storage, this is the solution! 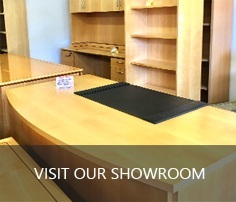 A hutch comes with a full size desk for your computer and writing, but it also has cabinets and shelving. Because it has so much storage (seriously, these things can be like three pieces of furniture in one) an office hutch takes up a lot of room. If you have a small room, this probably isn’t the best choice, but if you’ve got the space, the organization a hutch brings will keep your home office running smoothly. Now that you have your desk, you need something to sit in. While you can cut costs in a lot of places, your office chair should not be one of them, especially if you plan on spending hours working in your home office. If you’re trying to watch your budget, check out local estate sales or vintage shops for these key pieces. You can find unique options and cut costs! Once your furniture is moved in, you’ll start thinking about how to organize your office. Maybe you need some extra shelves or filing cabinets for your things. Even if you don’t have a lot of space, making organization a priority will help you in the long run. Even simple things, like hanging floating shelves will help keep equipment off your desk and give you more space to do your work. One of the most important factors in making your home office your dream office is how you personalize it. In the work place, you don’t get much say in how your space looks. Sure, you can change your desktop picture and add an interesting pencil holder, but for most office workers, that’s about it. Your home office is your chance to create a space designed specifically to inspire and motivate you. In just five steps, you can have the home office of your dreams. Whether it’s serene or bold and colorful, it will be perfect for you!